The history of Vietnam is a series of numerous stories and events as well as a long list of Emperors under different dynasties. Nguyen Dynasty is a memorable period under the reign of Emperor Nguyen Anh, whose era name is Gia Long. 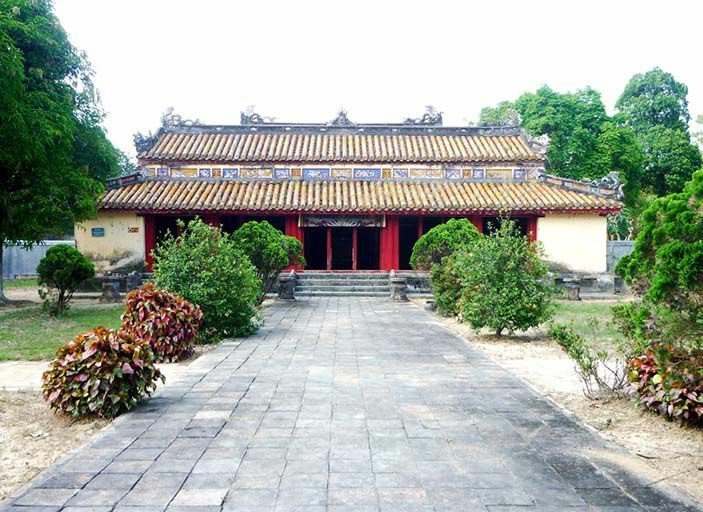 Nowadays, the tomb of Gia Long together with his family is located in Hue, the city of romance and ancientness. Located 16km from the center of Hue, on the top of the Thien Tho Mountain and on the west bank of the Perfume River. 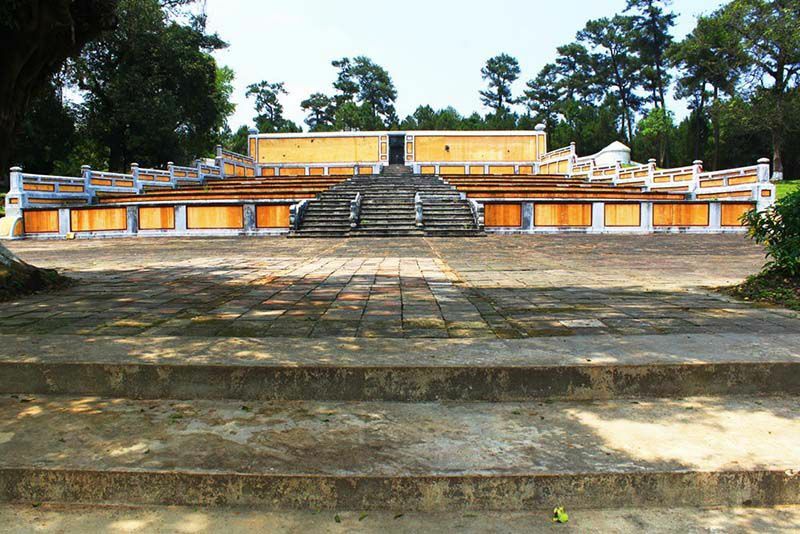 Gia Long Tomb is a complex of several royal tombs including the tomb of his mother, the tomb of himself and his wives, and tombs of other royal family’s members mainly built in 6 year, from 1814 to 1820. History was recorded that Gia Long was the first Emperor of the Nguyen Dynasty of Vietnam who was born in 1762 and died in 1819. Being a man of strong will who had spent his life on battlefields for almost a quarter of a century (1775 – 1801), he finally unified the country and came to the throne in 1802. His tomb consequently bore witness to a military commander’s unflinching character. Speaking of the King and Queen tomb alone, they were built over a period of time that saw the come and leave of three different kings. Though being the most distant tomb in comparison with those of other kings, Gia Long Tomb is the most scenic and impressive with regard to natural landscape of boundless mountains, pine forests and paths among grass and wild flowers. There’s no complicated building or extravagant palace but a complex fenced by 42 mountains and pine hill, named after the biggest mountain of the complex: Dai Thien Tho. The tomb is divided into 3 main parts. In the middle stand the tombs of the King and Queen. 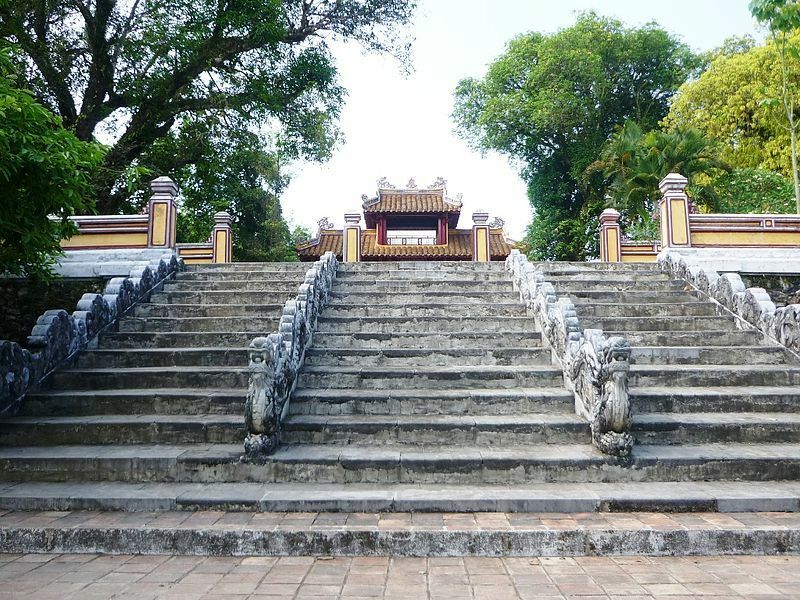 After the Honour court and up on the hill top is Buu Thanh, containing symbol of happiness and longevity. On the right of the complex is Minh Thanh Temple, where the King and his first wife are honored. Formerly, here’s the place to display artefacts related to the king’s military life. On the left is a stele pavilion, with 2 parallel coal-black roof steles for the couple. Those simple yet elegant steles are said to symbolize the love and loyalty of them throughout war and peace. However, due to war and time, only the left stele remains. Moving along the paths among the grass and wild flowers, under the fresh shady pines, tourists can visit other neighboring tombs in this section such as Quang Hung Tomb (the second wife of Lord Hien Vuong Nguyen Phuc Tan (1620- 1687), mother of Lord Nguyen Phuc Tran), Vinh Mau Tomb (the wife of Lord Nguyen Phuc Tran (1650-1691); Thoai Thanh Tomb (the second wife of Nguyen Phuc Luan and mother of Emperor Gia Long). The most noticeable one is the tomb of Queen Thuan Thien, mother of Emperor Minh Mang. Next to it is Gia Thanh Temple, dedicated to her. Even though the whole structure of Gia Long Tomb might not be so amazing and gigantic compared to other tombs of other Emperors, it is still a wonderful picture of nature and architecture, which provides a superb view of the boundless mountains and the solitary pine forest. Furthermore, the remains, though being damaged through time, are worth being preserved so that Vietnamese people can have something to memorize the past of their origin.